Affordable vacation homes in a luxury camping resort! 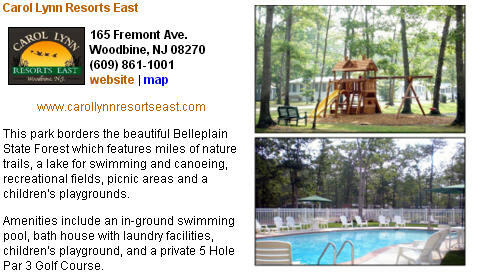 Carol Lynn Resorts East is located in Woodbine, New Jersey, a small town with a rich history and lots to offer! Carol Lynn Resorts East is only minutes away from the nearby beaches of Sea Isle City, Avalon, Stone Harbor, and Ocean City, and just a short distance from the famous Wildwood Boardwalk & Convention Center, Victorian Cape May, the Cape May County Zoo & Atlantic City’s fabulous shows, casinos & shops! Carol Lynn Resorts East is a family owned and operated seasonal resort featuring a 5 Hole, Par 3 Golf Course. Our sites offer privacy and plenty of space for patios, large decks and two car driveways – and no guest fees! Brand new NJ vacation homes with packages starting under $90,000 and pre-owned homes ready to move in. The gated entrance affords owners privacy and security while our parks small size offers a real sense of community with warm and welcoming neighbors. Click here to view the 2012 map of the sites available at Carol Lynn Resorts East. Bordering the beautiful Belleplain State Forest and just minutes away from the nearby beaches of Sea Isle City, Avalon, Stone Harbor and Ocean City, Carol Lynn Resorts East features a private 5 Hole Par 3 Golf Course, a gated entrance for privacy and security. Brand new custom homes starting under $90,000 – over 24 floor plans available – one, two & three bedroom models. Open April 1st – November 1st. Tours Every Saturday & Sunday 12pm – 4pm. Additional touring times available by appointment. Phone (609) 861-1001 or Email clre@carollynnresortseast.com.